Biocyte Ketoslim nuit® helps to regulate fat metabolism and destorage thanks to Coleus forskohlii and helps for weight balance thnaks to guggul. This food supplement also contains melatonin which contributes to the reduction of time taken to fall asleep. During the night, fat metabolism decreases, causing fat to be stored in the body. Biocyte Kétoslim nuit® helps break down fat while you sleep. It contains Coleus Forskohlii that helps regulate metabolism and the fat burning process, choline to restore normal lipid metabolism, as well as vitamin B6, and guggul for weight control. It is also formulated with melatonin, which reduces the time required to fall asleep. Better sleeping patterns improve weight loss. 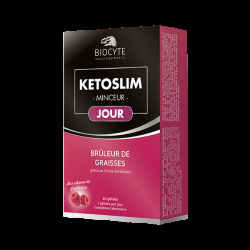 Thanks to Kétoslim nuit®, weight is controlled, while fat breakdown and metabolism are regulated! - Individuals looking for a slimming aid during dieting to destorage fats and control their weights. Food supplement based on Coleus forskohlii, vitamin B6, choline, melatonin, guggul, raspberry ketones, amino acids, and inositol. diet. Store in a cool and dry area, away from light. The beneficial effect of melatonin is obtained by consuming 1 mg of melatonin close to bedtime.